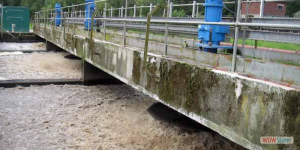 Following a series of concrete condition surveys undertaken by Ram Services Limited in the period 2004-6, Ram Services were asked to develop a series of remedial procedures to deal with the long term affects of severe frost damage, poor original construction and the effects of reinforcement corrosion on two 27m long, three span aerator bridges. Defects included large areas of crumbing concrete on the deck surface of the bridges, poorly compacted concrete along the beam arrisses, and areas of cracking of the concrete where reinforcement corrosion had set in as a result of poor cover. 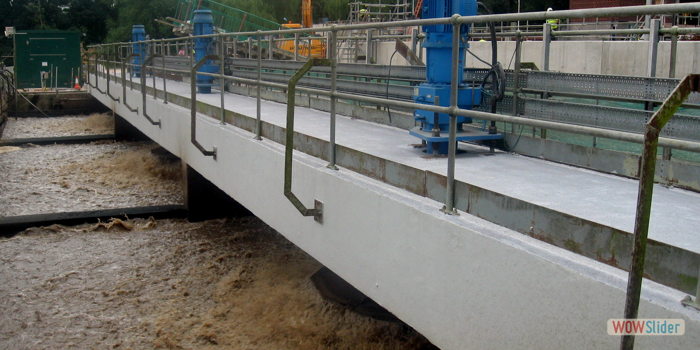 During two aeration lane outages, scaffold platforms beneath each bridge span were constructed, and all exposed concrete surfaces cleaned off using high pressure water jetting techniques. Defective areas of concrete were marked out, and a series of repairs using polymer modified cementitious repair mortar undertaken. Areas of poor compaction were cut back and made good with cementitious fairing mortar. 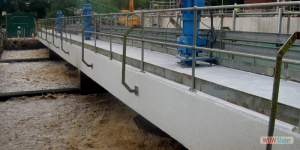 On completion of the repairs, the bridge decks were waterproofed with a polyurethane finish normally applied to multi-storey car parks, and the sides and soffits finished with an anti-carbonation coating system.